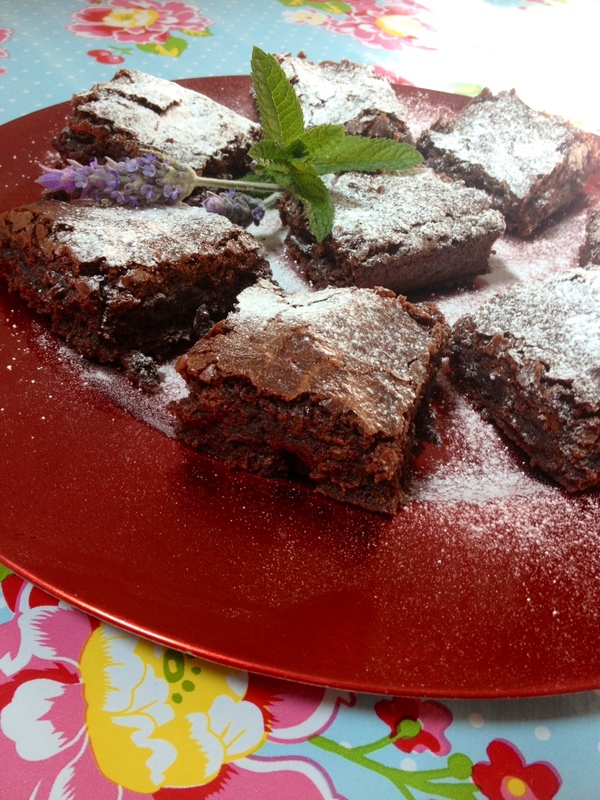 Sweet Dishes | La Rosilla - Lifestyle and food. #cookfromthebooks week 10 – Reunions & french fayre. A fabulously hectic week, of friends and frolics has left me literally unable to speak…my jaw has gone into painful spasm, maybe the price I’m paying for eating,drinking, laughing and singing too much 😉 So I’m now on soft food and alcohol free tipples, best recover soon. A few months back I volunteered on a language immersion course by Diverbo, to assit Spanish teachers in their quest to improve their English language skills, us volunteers were known as the ‘Anglos’. This week the Anglos of Southern Spain ( Malaga, Almeria, Murcia and Marbella) had a reunion, we re-grouped for a fabulous evening of wining and dining, laughter and merriment. 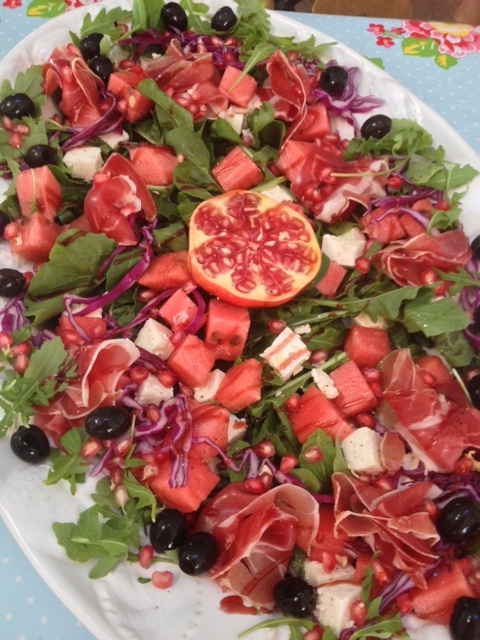 One of the gentleman known as ‘The Baron’ lives not too far from me at La Rosilla, so were pooled culinary skills and created a menu of french delicacies for our new friends. 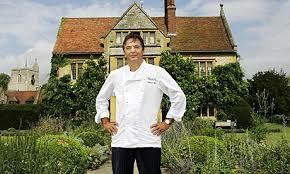 I have very fond memories of my visits to Le Manoir aux quat’saisons in Oxfordshire when I lived in England, reserved for very special treats, a place from the moment you arrived you feel clam, looked after and you know you are going to have an unforgettable experience. Dining, gardens, accommodation, all faultlessly designed. Unpretentious and impeccable service, makes every one feel special and welcome. My little pots of chocolate I adapted slightly and here is my recipe, rich, decadent and perfect for the chocoholics out there. Makes 8 little pots or glasses. Put all the ingredients in a heatproof bowl over a pan of simmering water stir gently, until melted. Pour into shot glasses or espresso cups. Our reunion was a great success, all different characters from all walks of life, coming together to re-confirm our new friendships. 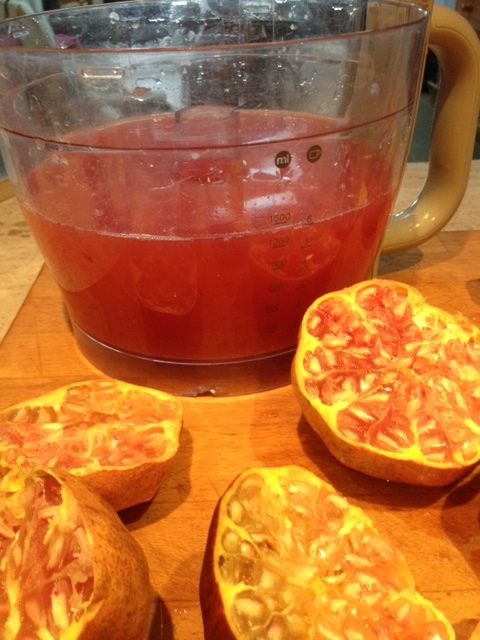 #cookfromthebooks week 9 – Carnival capers, supperclub visit & almond tart. The end of Semana Blanca holiday (half term here) in Malaga province, went out with a bang. A family day out on the coast enjoying blue skies and warm sunshine, a chance to finally sample a fellow supper-clubbers Rooftop Table’s gourmet ‘Thai’ delights, dancing on a bar, well it was ‘Carnaval‘ and afternoon tea with tart, Almond & raspberry slice, from Bill Granger’s book, aptly named ‘Holiday‘ . 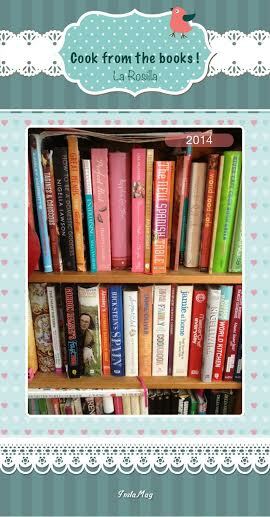 I can’t believe it’s week 9 of my personal #cookfromthebooks challenge already, this has got to be one of my best New Year resolutions ever, a win, win resolution. 🙂 That I’m loving sticking to, and everyone else is enjoying the fayre. 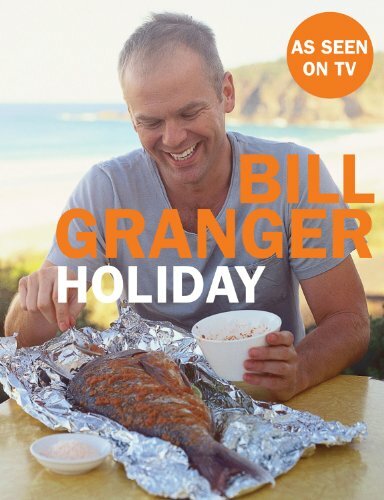 Bill Granger’s style is chilled and comforting, this book, focuses on occasions and events all related to relaxing and food. Outdoors, fireside, celebrations and barefoot. I knew we were expecting a hectic week-end of revelry, so I decided on a decadent and rich Almond and raspberry slice recipe, to enjoy as and when we wanted, whilst taking a five minutes to sip tea and chillax. All the ingredients I had in the fridge and store cupboard, and I easily managed to put it all together in between chores before going out. It has a crunch shortbread bottom, fruity layer of jam (use your favourite flavour) and a sweet nutty topping, definitely not an everyday treat 😉 . Don’t make the mistake I did, and add all the sugar at the almond stage, it then is really sweet !!!! Make the shortbread base : beat the remaning butter, sugar and vanilla, until pale & creamy. Sift the flour and cornflower together and beat into butter mix until crumbly. Press the dough into the baking tin and bake for 12 mins or until light & golden. Leave to cool for 10 mins. Spread the jam over the base, then the almond mixture. Return to the oven and bake for 25 mins more. Enjoy with tea & breathe ! Family rating adults 10/10 chi8ldren 7/10 dare I say too rich for them !! 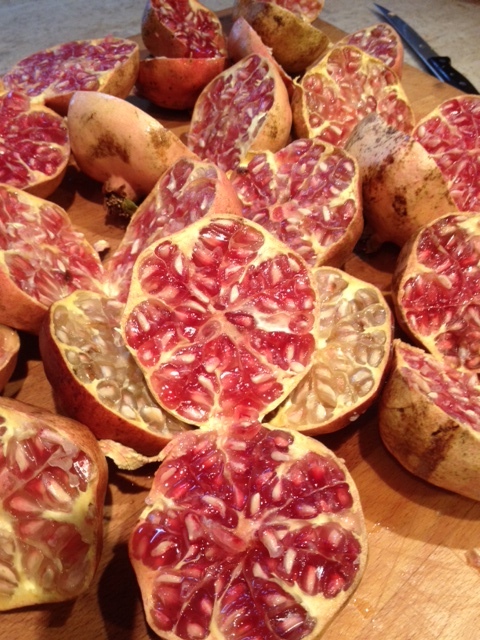 No i’m not talking about giving up the vino of course, a little less I have admit now it’s back to school time, but drying out some of summers bounty to preserve its sweetness and flavours for the coming cooler months, prolonging that taste of summer just a while longer. 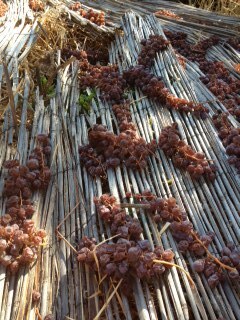 My grapes were picked and put out to sunbathe for tiny raisins or currants, to be used in baking over the autumn or sprinkled in salads or cereals for breakfast. Drying grapes in our area of Spain is very local tradition, which is celebrated with the ‘Ruta de Pasa‘ a lovely drive through the mountains’,taking in scenic whitewash villages, who lay out the grapes on the mountainside to dry beautifully in the Anadalcuian sunshine. These will then by turned into unctious sweet Malaga wine and sweet delicacies. 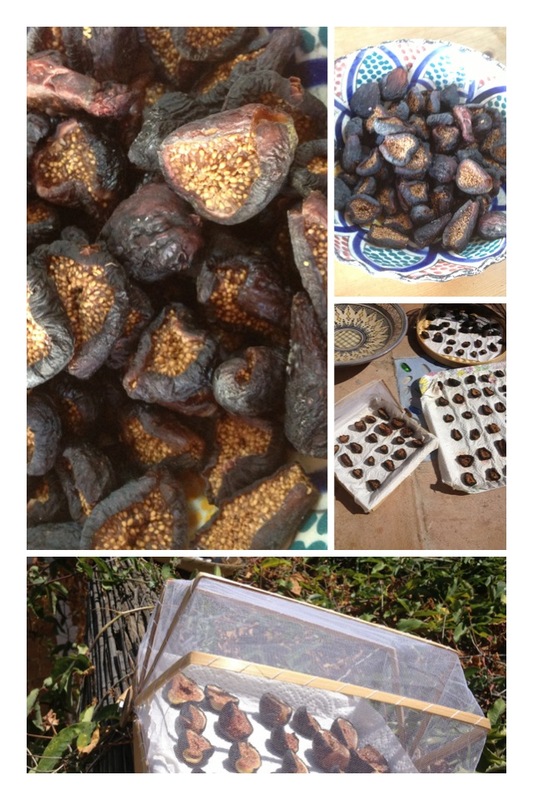 Delighted this year I had a bumper crop of figs, fresh chutney was made, that will be enjoyed with strong cheeses and roasted meats, but I tried something new, I sundried my figs too .. for recipes such as ‘pan de higo’ a delcious figgy roll that is enjoyed as a tapa, or after dinner with a rich PX sherry and a slither of cured goats cheese. 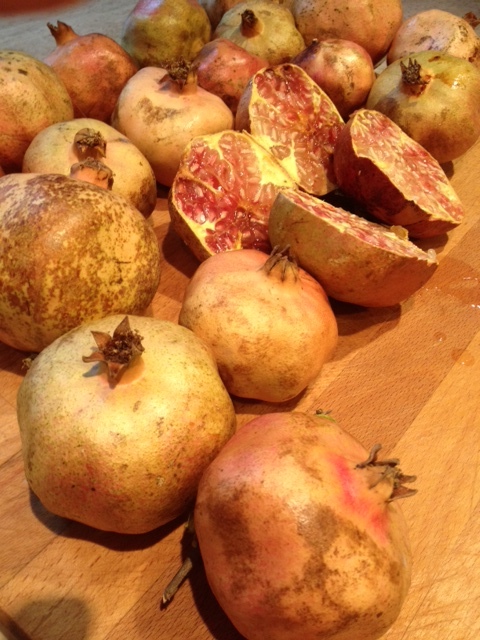 Picked, wash and halve the figs. lay out seperately on trays lined with kichen paper. Cover with fly nets and lay out in the sun to sry for a few days. Bring in at night if where you are the morning are damp. 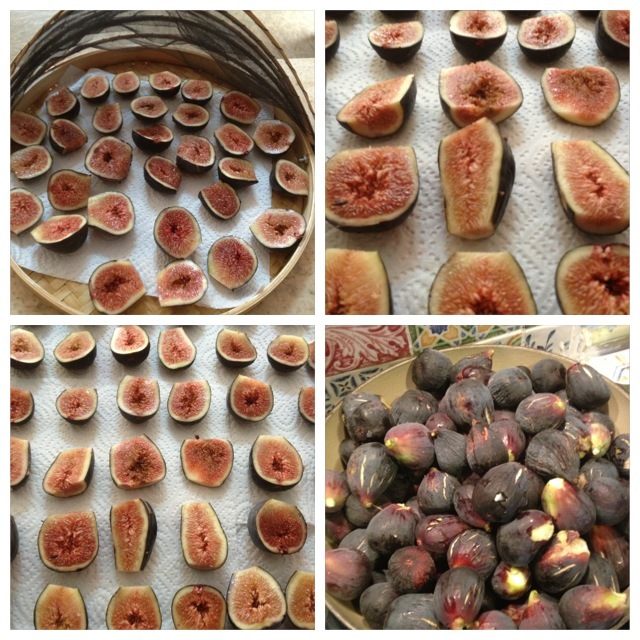 When the figs are dry and chewy, store in an airtight container and enjoy. I also dry my tomatoes in the sun, you can read about that here. Seems the weather keeps teasing us and giving us a taste of what’s to come – A day of glorious sunshine in between the dull & rain, is enough to lift the spirits , time to fling open the windows, lunch alfresco and the drudgery of the daily homework routine somehow seems all more bearable done in the afternoon sun. Yesterday we we’re singing with the birds, everyone was cheery, flowers were picked to add a springtime bloom and the children gathered their boots & walking sticks and returned once more to their Swallows and Amazons lifestyle, trekking and exploring their mountainside with dogs & cats in tow. 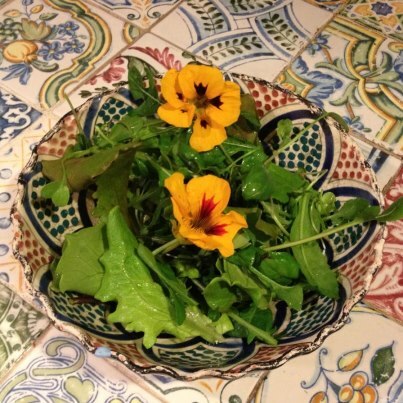 My main vegetable patch is in need of resurrection, I’m trying to build the enthusiasm to to tackle it head on, what I have done, is create a little mini herb & salad patch in the border at the back of my house, just by the kitchen door & yesterday we enjoyed our first pickings of leaves & herbs & edible flowers in a fresh green salad. We are down to one hen at the moment 😦 but soon her new friends will be arriving, I think she is enjoying eating solo and not having to share, and bless her she lays an egg everyday for us, good job really, as I often start a recipe or dish and then think …’bloody hell’ have I got any eggs ? . 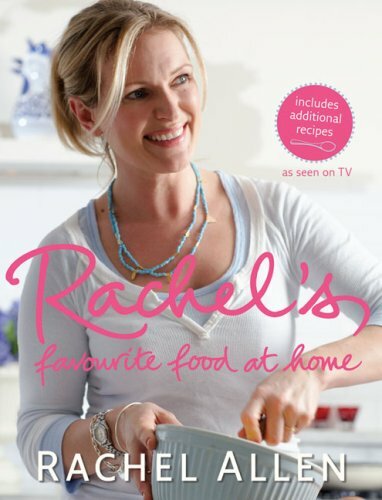 Yesterday was no exception, scouring the fridge for inspiration & decided to rustle up a red cabbage slaw, Oh no no mayo,- no worries I’ll just whip some up – Oh no, no eggs – Off to Henny Penny I trudged , she hadn’t let me down. Today we’re back to wet & grey, with even talk of a ‘Red’ alert on weather warnings ! So I’m feeling the need for comfort food and sharing. 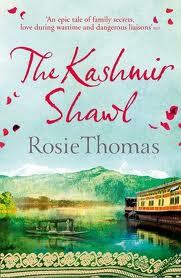 Luckily this afternoon is my ‘Book Club’ and we going to chat about The Kasmir Shawl by Rosie Thomas , a tale of The Raj, Colonial India & Wales, so I’ve baked a spiced Tea Bread & Victoria Sponge, hopefully sweet tastes to match the beautiful tale. 250 gr of Sultanas soaked in 300ml of cold tea, leave overnight. 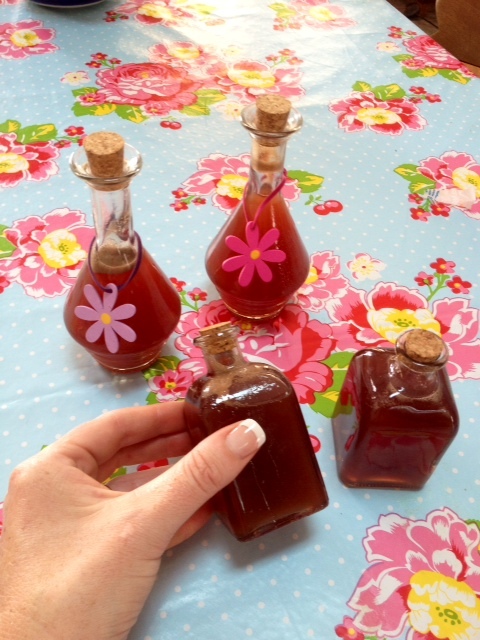 I use a Moroccan tea, flavoured with cinnamon, chicory, liquorice, orange & mint. 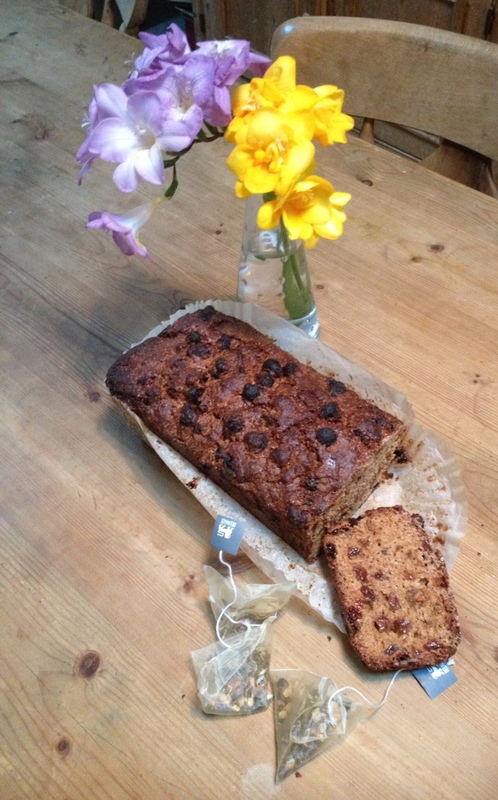 Stir well together – then pour into a lined 2lb loaf tin – bake at 175 c – for 1 hour until risen and dark golden. Enjoy with butter and jam and of course a lovely cup of tea. I think this must be the windiest winter on record, well it’s certainly the windiest we’ve experienced living on the mountain. In fact in the 8 years we’ve lived here , we’ve lived through many weather records, the hottest summer, the wettest Autumn, the driest winter, Snow first time in 80 years .. we call it living in extremes, or all weathers. The skies have been so clear and blue this winter, and on most days we can see the snow topped mountains of Sierra Nevada and the Mediterranean sea – journeys to the coast afford views of Africa, and its Moorish headlands. The wind though has paid it’s price, this morning hiking up the mount to the meet the school bus, I had to hold on to my little daughter as she was almost blown away, we sheltered in a nook from the howling wind, olives that have not yet been picked were hurtling through the air like missiles. As soon as it comes though it subsides, and calm prevails once more. Today the wind is back, and the temperature has dropped, so the home fires are burning and warming comfort food is needed – Albondigas are bubbling away, and a tray of luscious Oatie, fruit & nut flapjacks have been made to enjoy with a little camomile & honey tea. What a difference a day makes, but it keeps us on our toes, and makes us make the most of all weathers. 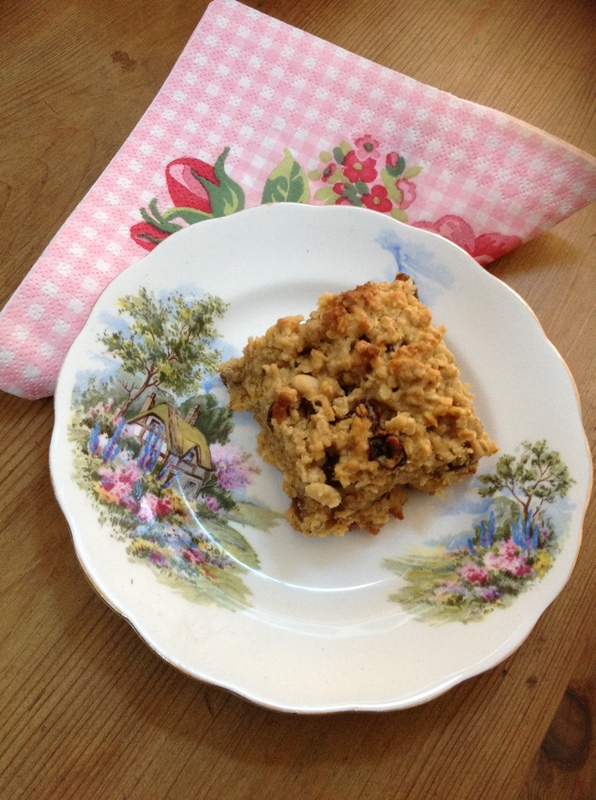 Here I share my recipe for a very large tray of Oatie, fruit & nut flapjacks. 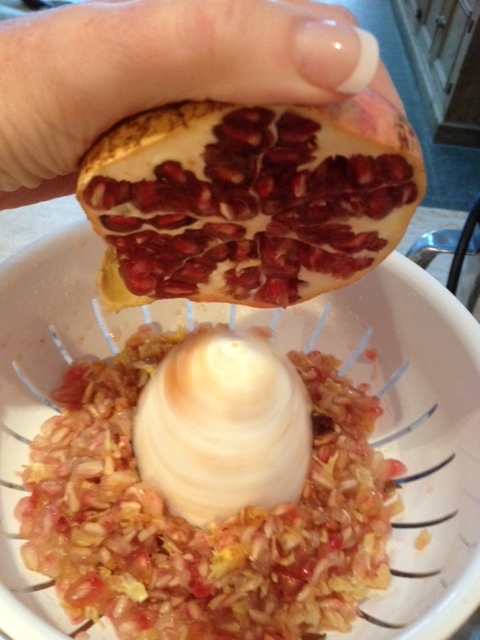 Put juice, zest of fruits & sultanas in a saucepan and heat gently, for the sultanas to plum up – for about 5 mins. Add butter , syrup & sugar to the pan and heat gently until all melted. In large bowl put flour, oats & nuts, mix then add melted mixture, stir well until thoroughly mixed. Cut into squares whilst warm then allow cool. Baking across the miles ! Well what a few weeks, living the dream NOT ! Weather, floods, landslides, bureaucracy, hospitals, banks – Enough is enough, Basta Ya ! It’s Friday & I need that Friday feeling, and that means creating comfort and all things sugar & spice. 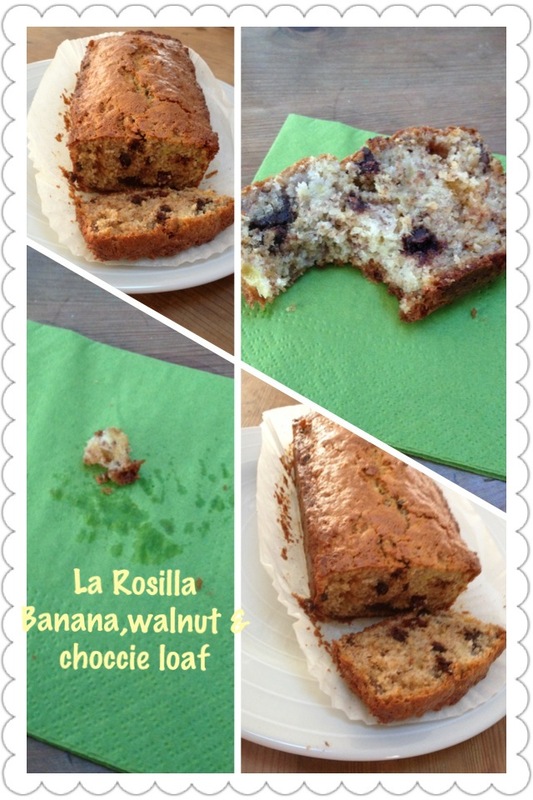 My trusty Banana, Walnut & choccie bread is on order, filling La Rosilla, with aromas good enough to calm the most stressed soul. Whilst baking in the oven, & stirring rumbles in my tum, I tweeted my doings, and a twiend @mosscottagebnb replied ‘have a go at my recipe’. I perused said recipe, and it confirmed Bill & I had very similar tastes & recipes, mine a little more thrown together, well It’s Friday after all, but I’m sure the outcome just as delish. Bake in the oven 50 mins to 1 hour, until golden & risen and a skewer come out clean.